It was, by no surprise, a long day, although it was much longer than expected. 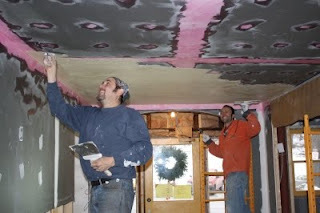 We plastered the bar ceiling, and by saying we I largely mean Jack, but that would not give credit to all the helpers, namely E! 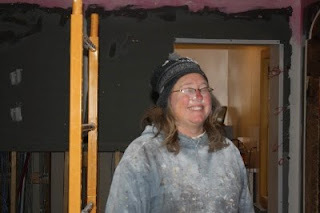 (master plaster mixer, who was just crazy busy all day), and Sarah (who applied plaster weld on the bar ceiling all morning long). 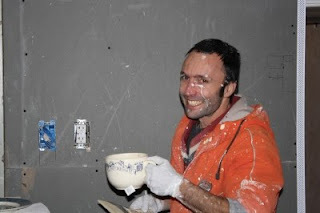 But the man of the hour (or hours), was, as with the Stube ceiling, our master plasterer Jack. He just whipped the mud onto the ceiling like there's no tomorrow. He was kind enough to leave me a few corners to play around, because I could not keep up. 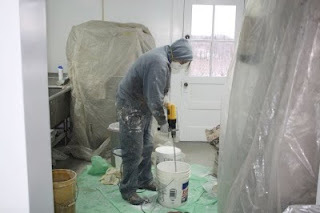 Mixing plaster is dirty work, and the ingredients (plaster and lime) aren't particularly healthy. 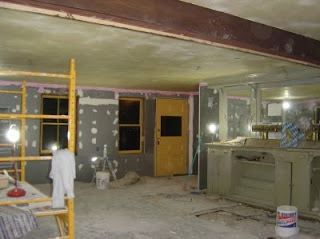 Plastering itself, however, is fun, albeit hard work, especially when plastering ceilings. It is definitely dirty work. But it is soooo worth it. Let us not forget Die Sarah also fed us well -- that girl and her garbanzos gave us much joy! Thank you Sarah! Hope to see you around soon! Vacation has officially started and we are either layabouts or frenzied fixer-uppers but both are happening right here - on Maple Ave - in Clintondale.